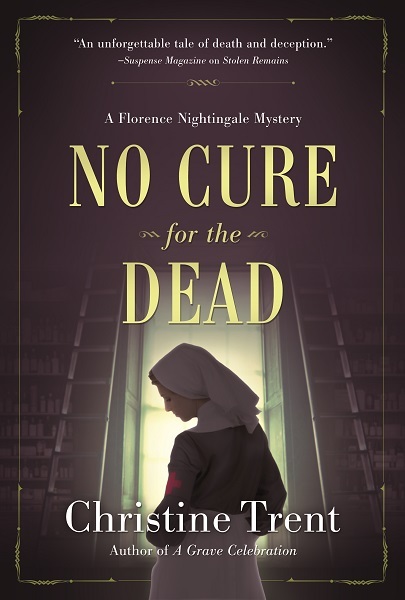 I wanted to send you a special note to let you know that NO CURE FOR THE DEAD, the first of the new Florence Nightingale Mysteries, is now available for pre-order on Amazon! This is my tenth book, and will be my first hardback release. It is currently available in hardback and e-book, but stay tuned for details on paperback and audio releases. I’m also quite pleased to share the cover with you here. I would be thrilled to hear from you on your thoughts on this cover, which is quite a departure from my Lady of Ashes covers. The book releases May 8, 2018, from Crooked Lane Books. For fans of Anne Perry and Laurie R. King comes No Cure for the Dead, the rich and enthralling series debut from Christine Trent. I hope you enjoy this new series as much as you’ve enjoyed Violet Harper’s adventures. And don’t be surprised to see a young Violet appear in NO CURE FOR THE DEAD!